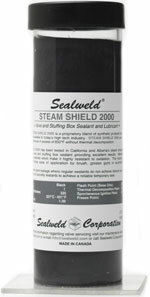 Sealweld Steam Shield 2000 is a proprietary blend of synthetic ingredients that when combined, exceed the ratings of the components. As a result, Steam Shield 2000 lubricant/ sealant withstands temperatures up to + 398C or + 750F with minimal thermal decomposition. Steam Shield 2000 provides an insoluble film of synthetic lubricant to protect valve seal faces and reduce torque requirements. Steam Shield 2000 is non-melting and insoluble in water, steam and related by-products. Tested in California and Alberta's steam-enhanced recovery projects as a valve and stuffing box sealant, Steam Shield 2000 demonstrated excellent results. The viscosity of Steam Shield 2000 allows for ease of application using a brush, grease pump or automatic injection equipment. In cases of extreme valve leakage where regular sealants do not achieve desired results, Sealweld offers a full range of specialty sealants to achieve a reliable temporary seal.